Hello, my name is Alice and like most gals I love beautiful polished streak free nails. After years of fighting with the nail polish bottle and numerous spills ruining tables, bedding, carpets and clothing, I started to search the local beauty stores for a holder. My search turned up nothing and after some research I found that no one had solved this problem. I came across a holder that was really nothing more than a hard-piece or rubber and I felt that I had to force the bottle into it, and broke a nail doing it. Another holder would hold the bottle sideways but it simply did not work. 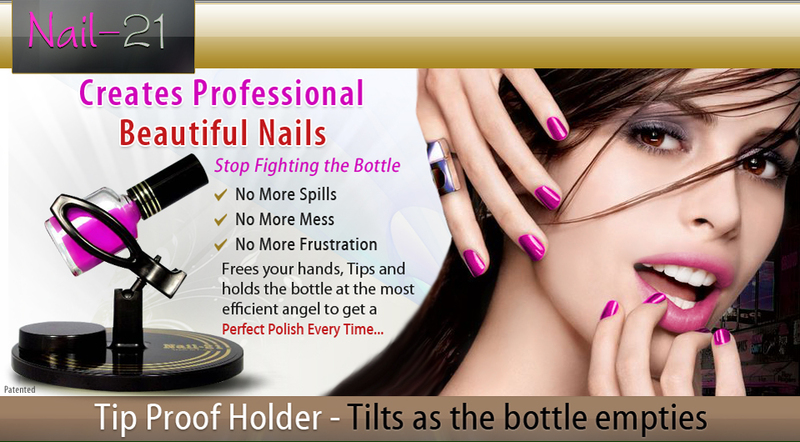 I created Nail-21 which holds the bottle straight providing a tip proof surface and as the bottle empties it will tilt so you get the right fill for the perfect polish every time. After appearing on the Dr. Phil show, I received many emails from women around the country who searched for a product like this and could never find one. I think Nail-21 is a great idea for holding nail polish. There is a holder on the market that only holds one style of nail polish bottle. I use OPI and it won’t hold it but Nail-21 works great. I have been looking for a product like this for a long time. When I have my nails polished, the manicurist holds the polish at an angle in order to get a full brush of polish. When I do mine at home, I can't hold the bottle at an angle. Nail-21 makes it easy. I use to skip paining my nails and toes because it was a pain and a mess. You have to pick up the bottle every time you want to get more polish. With Nail-21 it makes it so easy. Try one today you will love it. I am very into doing my nails at home as opposed to paying at a salon and I think Nail-21 is very useful. I’m a professional Nail tech and Nail-21 is great at my station, it holds the bottle for me so I have both hands to work with. © 2011 - 2015 ® - Nail-21™ is a trademark of Sansan Design, Inc all rights reserved. All Rights Reserved.